US presidents have travelled in Boeings since 1943 but John F. Kennedy was the first to fly in a purpose-built aircraft, a Boeing 707. The current fleet is made up of 747-200B series aircraft that first came into service in 1990. The US Air Force announced in January 2015 that these would be replaced with two 747-8s, with $2.87 billion set aside for the project between now and 2021, according to budget documents. The current 747-200Bs now in service has around 370 square metres of interior floor space which includes a presidential suite complete with office, bed, gym, lavatory and conference room. A second office also doubles as a medical operating room. There is also a dining room as well as separate sections of the plane for presidential staff, security teams and the press. The aircraft have a flying range of 6,735 nautical miles but is capable of refuelling in midair. Armour plating ensures the plane can withstand a nuclear blast on the ground. All windows are made of bullet-proof armoured glass. Electric defence systems jam enemy radar and confuse missiles, while mirror ball defences hidden in the wings can overcome infrared guidance systems. Onboard electronics and communications are designed to withstand electromagnetic pulses. The 747-8 will a range of 7,730 nautical miles, or around 1,000 nautical miles further than the 747-200B. With a speed of .855 mach, the 747-8 is the fastest commercial aircraft in the world. 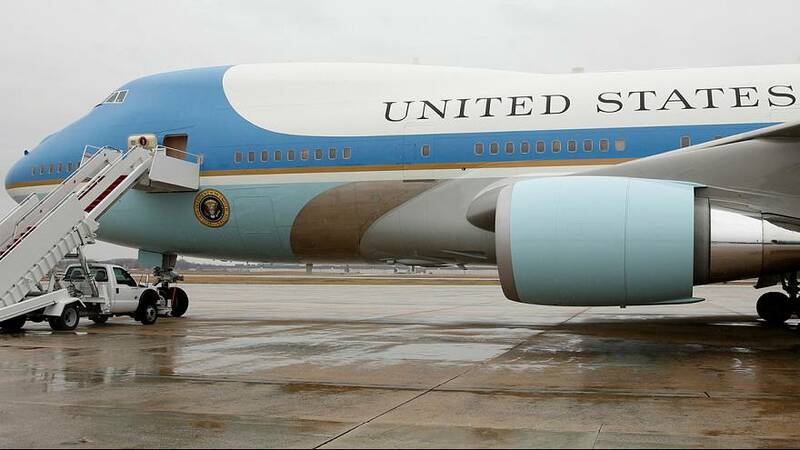 The outgoing Air Force One planes have a top speed of .84 mach. The new planes will be 76.25 metres long, compared to the 70.6 metres of the 747-200B. Wingspan will be 68.4 metres, compared to 59.6 metres.